The hotel industry’s only purpose-built virtual assistant adds interactive voice- and touch-activated functionality for enhanced guest room automation. San Jose, CA – January 9, 2019 –Angie Hospitality, developer of the world’s first voice and AI solution purpose-built for the hospitality environment, today announces the integration of its award-winning virtual assistant solution with the industry’s prominent room control platforms, including Honeywell’s INNCOM Guest Room Automation System. As a result of this integrated technology solution, all guest-facing room automation features can now be controlled using either the device’s interactive voice interface or its built-in touchscreen. This allows hoteliers to provide enhanced guest comfort and convenience, while improving energy efficiency and reducing operational costs. Angie’s full support of guest room automation and energy management functionalities includes temperature control, allowing guests to remotely control room thermostats via voice or the device’s built-in digital touchscreen. Occupancy sensors built into the thermostat can detect when a room becomes vacant and adjust settings accordingly, providing hoteliers with the ability to save, in some cases, as much as 30 percent in energy costs per room each year. The integrated solution also adds the ability to control many other guest room amenities via Angie’s interactive voice control or touchscreen, including lighting, drapes, minibars, televisions, safes and even door locks. Apurv Johari, general manager of INNCOM by Honeywell said, “We are proactively integrating with voice control vendors because voice technology is the future of luxury hospitality. Hotels want to provide a superior experience comparable to what guests have in their home. Home voice control devices are in wide adoption and Honeywell is working with hotels to provide the same convenience in guest rooms.” INNCOM’s extensive range of industry leading guestroom technologies includes voice control of room temperature, lighting, amenities, and drapery equipment that creates a personalized guest experience. In addition to room control, Angie’s award-winning multi-functional platform serves as an IP telephony solution, replacing guest room telephones and adding an entire suite of convenient amenities. The system’s high-fidelity Bluetooth speakers allow guests to enjoy their favorite music and make hands-free phone calls. The device also acts as an alarm clock, night light and a convenient in-room medium for guest engagement, creating a host of revenue opportunities. As a secure in-room access point, the Angie platform also immediately upgrades property Wi-Fi to meet today’s ever-increasing bandwidth and security needs. Angie’s room automation integration is fully customizable, allowing individual hotels to select which specific functions they wish to integrate. The combined solution also includes analytics and monitoring functionality. Via a property’s management portal, hoteliers can review usage data that is securely and anonymously collected, providing them with valuable information on how to further enhance guest experiences and service performance. For more information on Angie’s full suite of capabilities, please visitangie.ai. About Angie Hospitality |Angie Hospitality, founded by hospitality industry veterans, is the developer of the first 24-hour interactive guest room assistant purpose-built for the hotel environment. 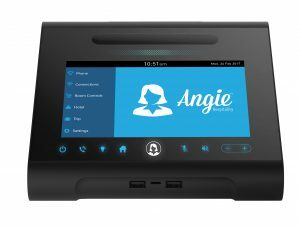 Angie‘s patented technology uses both voice control and touch screen capabilities to offer a complete solution for hoteliers looking to increase guest satisfaction, streamline operations, improve staff efficiencies and maximize revenue opportunities. The platform offers configurations to provide IP telephony, room automation features, energy management and more, through seamless integration with leading hotel technology system providers or as complete stand-alone system. Angie instantly upgrades any hotel room, allowing guests to play their own music through its built-in Bluetooth speakers, make hands-free calls, access hotel amenities, charge their mobile devices, and much more. Angie can even provide guests a customized and secure in-room Wi-Fi network. Based on an enterprise-class, cloud-managed platform with secure, scalable and highly-available architecture that is continuously monitored, Angie’s systems self-configure for each property and room as soon as the device is plugged in. For more information on Angie Hospitality, the 2017 HTNG TechOvation Award winner, please visitangie.aiand connect with us onFacebook,Instagram,Twitter,LinkedInandYouTube. About Honeywell Building Technologies |Honeywell Building Technologies (HBT) is a global business with more than 23,000 employees. HBT creates products, software and technologies found in more than 10 million buildings worldwide. Commercial building owners and occupants use our technologies to ensure their facilities are safe, energy efficient, sustainable and productive. For more news and information on Honeywell Building Technologies, visit http://www.honeywell.com/newsroom.